From my first ever New year’s resolution when I was 8 years old; “I will not spit on anyone this year”, I have relished a good resolution. For the past two years, they have centered around cooking. On the eve of 2010 I resolved that ‘I wanted to become a better cook’. I have always been a decent cook but I wanted to push myself out of my comfort zone and learn new techniques. I think I executed that resolution with success and my then boyfriend/now husband (who you will learn over future blogs is a ridiculously hard critique) agrees. My most recent annual resolution was to continue the cooking quest, with a particular focus on all things sweet. I have been a majority savory cook, and have felt uncomfortable with the technicality of most things sweet other than biscuits. So, this year I’m learning how to wow with desserts. I will try the ultra technical and the super cheat easy… which is what the following recipe is all about. Before the Easter long weekend I sat down with my recipe books/magazines of the moment to see just how I could get myself involved in the chocolate festival. My Feast by SBS (Edition 8) magazine gave me the most inspiration. On page 60, I found a quirky ‘Chocolate Salami’ or ‘Salame di cioccolato’ (NB: sounds heaps sexier when you try and say it the Italian way upon serving). 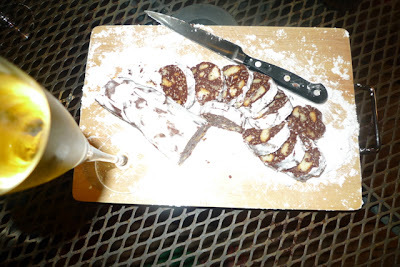 Basically, this dessert is like a salami-esque log, which you slice into portions. The picture in Feast, suggests that you consume with coffee, but this screamed best post dinner party excuse for dessert wine ever. The recipe makes two logs to slice up, so you can keep one for more sober moments the following day. The reason why I seriously recommend this to amateur sweet chefs like myself, is that it was bloody easy! It actually involves no cooking, just some melting, mixing and refrigeration. And it looks super chefy next to a glass of Noble One sticky wine. For a third course to a dinner party, it’s perfect for a mouthful or two. However, my husband, Lex, myself and our guests (hi Sara and Arie!) managed a fair few mouthfuls. NB: The original recipe has two tablespoons of amaretto, which is optional. I hate the stuff, so I substituted with about Cointreau, which gave it a slightly orange flavor- yum. The coconut in the below version was also not in the original recipe- but I think it really worked and it made it look even more like salami with the little white flecks! 200g Nonnas biscuits, roughly chopped (these are a tea-dunking biscuit found at Italian food shops. You Can substitute with a fairly plain Arnott’s shortbread. 1. Melt chocolate in heatproof bowl over boiling water (do not let the water touch the bottom of the bowl). Cool slightly. 2. Using an electric mixer, beat butter, sugar and vanilla on a high speed until pale and fluffy. Add egg and Cointreau, and beat slowly until combined. Stir in chocolate biscuits and toasted coconut and stand for 10 minutes. 3. Divide mixture between 2 large sheets of baking paper, roll each up tightly, shaping into 4cm x 20cm logs. Twist ends to seal, refrigerate for 8 hours. 4. 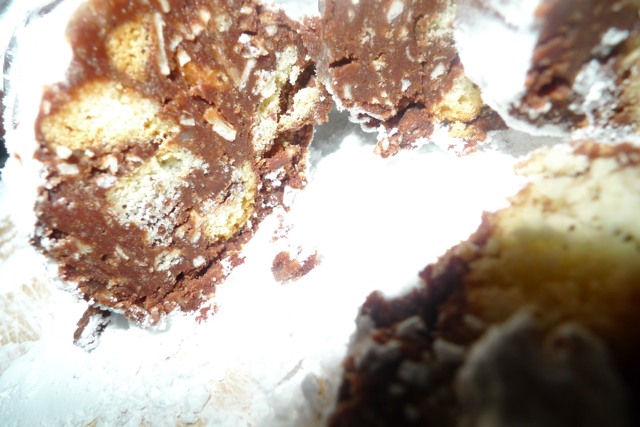 To serve, unwrap with generous amounts of icing sugar and thickly slice. Don’t forget the dessert wine or coffee!